Not because I live in Victoria, although… The idea came from Eat Magazine and their picture with the caption ” Pander the Gander”. The brine and stuffing are almost exactly the recipe from Lucy Waverman’s column, “A Dickens of a Dinner, a Victorian Holiday Feast” (Globe and Mail Dec 8, 2010). The technique is from the December issue of Cooks Magazine for the glazed turkey. My Goose grew up in the Fraser valley and travelled to Slater’s, the butcher, on Dec. 22. So I picked up Mimi the Goose, all 10 and 1/4 pounds of her, wet and naked, at Slater’s on Wednesday and thought she could use a couple days off to recover from the ride with BC Ferries. In fact, the poor thing was so shaken that on Friday, I decided that she needed a day at the spa and a perfume bath, aka the brine. I put her in my cherished Le Creuset blue tub with 3 liters of cold water mixed with a brine made of 1 l of water (= 4 cups), 1/2 cup sugar, 1 cup kosher salt, the rind of 1/4 orange, 1 tbsp cracked peppercorns, boiled 2 minutes. There were no bubbles, but it was all natural! Mimi liked it so much she soaked in there overnight despite being outside on the cold patio. I let her sleep in Friday morning, then patted the poor dear dry, rubbed her with a kind of talcum powder combining 3 tsp baking powder, 2 tsp salt, 1 tsp ground pepper and let her air dry some more on a rack so that her skin would take a better tan later. Then, I inserted two cloves garlic, two smoked sausages, a mandarin peel, thyme, in her chest cavity, closed her off and pushed slices of black truffle under her skin. I also nicked her all over with the tip of a knife so her fat would drain out during her visit to the tanning salon. The thermostat was at 33o for an hour and 3/4, a slow start. Then 30 minutes rest while I drained the fat into a glass jar. Le Creuset Stock pot used as Hot-tub, or rather cold bath. During the next 30 minutes of cooking the heat was higher, about 360, and she required frequent applications of tanning lotion, at least 3 or 4 times. This glaze was made by reducing 1/2 cup molasses, 1 cup red wine, 2 tbsp balsamic, 1/2 can cranberry sauce, 2 tbsp Cognac, a small chunk of butter, salt and pepper for 20 minutes. This glaze created a perfectly crisp brown skin. 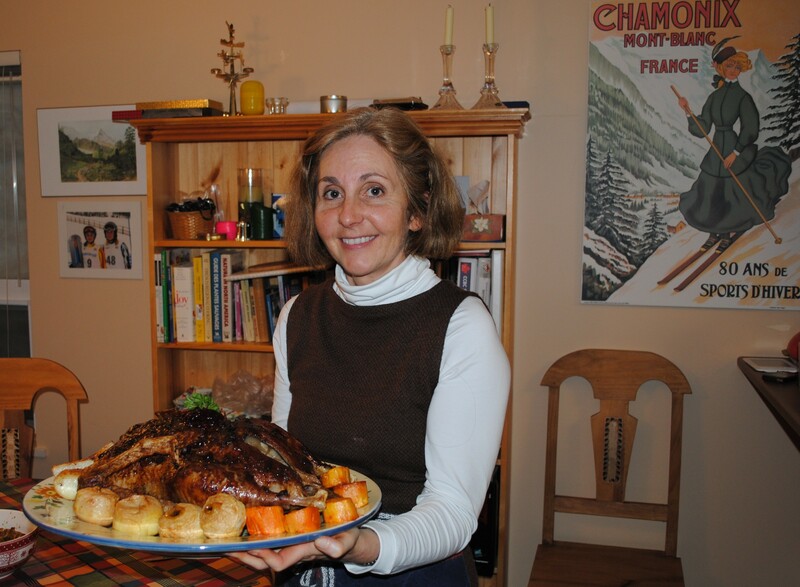 I served the goose with potatoes, yams, chanterelles, baked unsweetened apples (the tartness is nice to counterbalance fat), gravy and prune stuffing. For the gravy, pour all the fat from the roasting pan into jars to save. Add a cup of water to the pan to deglaze, add whatever is left from the glazing mix and stir. You should not have to add flour. For the stuffing, sauté 1+ 1/2 cups chopped celery, 5 sliced green onions, 2 cloves garlic, in olive oil for 10 minutes. Add thyme, sage, 1/2 cup chopped parsley, 1 tsp soya sauce, 2 tbsp Cognac, 12 chopped prunes, 1 cup white wine, salt and pepper. Bring to a boil, add one cup crushed croutons and stir. This is more stuffing than can fit inside the bird, so it is more practical to serve on the side. The goose was tender, moist, gamy and very tasty. No one ever wants to have turkey again! The 10 pounder was plenty for six large servings, just enough left-overs for the next lunch, a nice jug of broth from cooking the bones, and of course the precious goose fat. 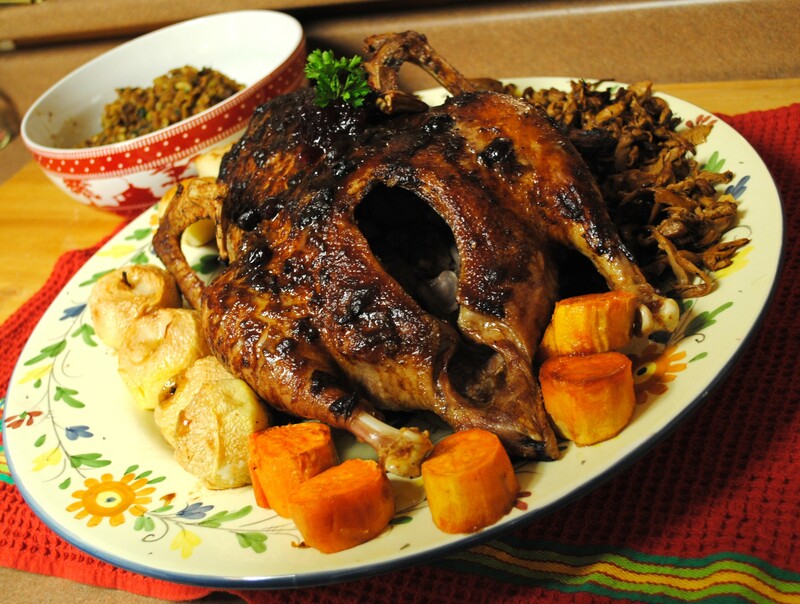 This entry was posted in Main Course and tagged food, goose, goose fat, goose stuffing, new year's dinner, new year's menu, recipes, stuffing, verygoodrecipe. Bookmark the permalink. best meal i have ever eaten. thanks Mimi!